On 17 April 2012, the High Resolution Stereo Camera (HRSC) operated by the German Aerospace Center (Deutsches Zentrum für Luft- und Raumfahrt; DLR) on board ESA's Mars Express spacecraft acquired images of a region in Melas Dorsa. 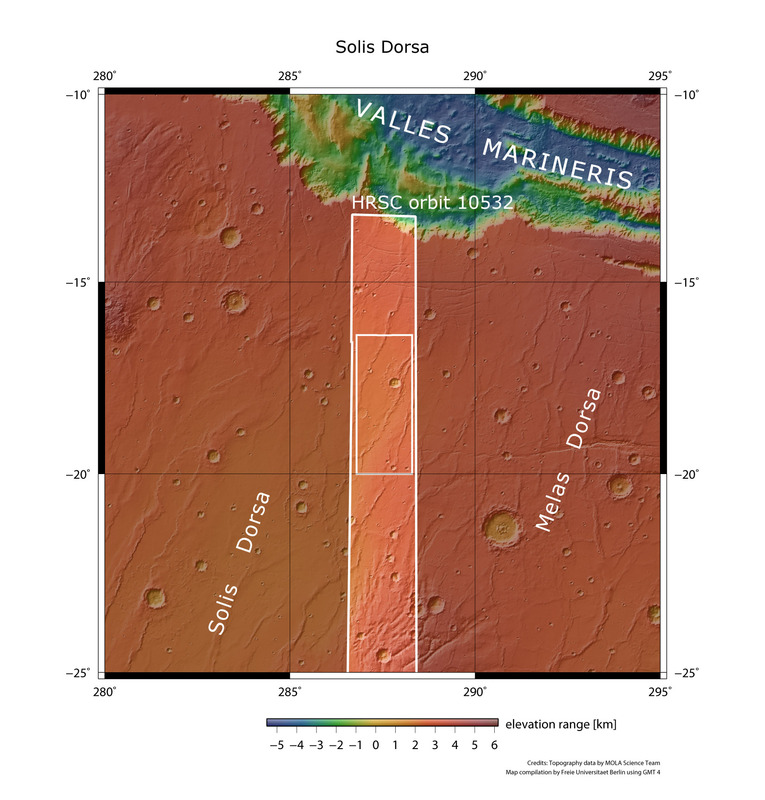 Melas Dorsa is located in the volcanic highlands of Mars between Sinai and Thaumasia Plana, about 250 kilometres south of Melas Chasma, which is the central part of the large Valles Marineris canyon system. A large, oval crater measuring about 16 kilometres across is immediately apparent in this image, with its ejecta blanket taking the shape of a butterfly. To form such an ejecta blanket, the impact must have occurred at a very shallow angle with respect to the planet's surface; it is thought that subsurface ice was present, and that this liquefied or vaporised on impact. Ridge-like structures resembling twisted rope extend across the image. These terrain features are known as 'wrinkle ridges'. Although volcanic in origin, wrinkle ridges are tectonic terrain forms. They arise in volcanically deposited rock layers that form out of a single hardened lava flow. During the cooling process, the lava contracts and strong compressive forces are generated. The pressure causes areas of rock to shrink - and the corresponding reduction in surface area causes these characteristic wrinkles to form. Another interesting tectonic phenomenon can be seen in the left half of the full image. After the formation of the wrinkle ridges, further displacements occurred in the crust, which caused several faults to arise. Arranged in a receding sequence, these stress faults run across almost the full height of the image. Formations of this kind are also found on Earth, and are referred to as 'en echelon' displacements or step faults. Another striking feature is the filled crater in the upper part of the image. This shows evidence of concentric deposits, which could provide insights into the material properties of the filling. 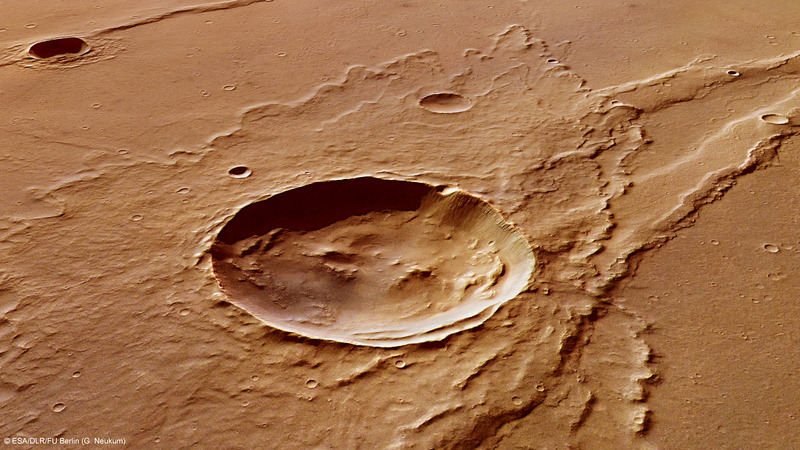 These HRSC images were acquired during Mars Express orbit 10,532. The image resolution is approximately 18 metres per pixel. The data was acquired at approximately 18 degrees south and 288 degrees east. 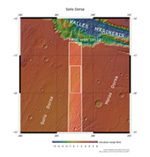 The plan-view colour image was created from the nadir channel, the field of view of which is aligned perpendicular to the surface of Mars, and the colour channels; the oblique perspective view was generated from HRSC stereo channel data. The anaglyph, which creates a three-dimensional impression of the landscape when viewed with red/blue or red/green glasses, was derived from the nadir channel and one stereo channel. The colour-coded plan view is based on a digital terrain model of the region, from which the topography of the landscape can be derived.